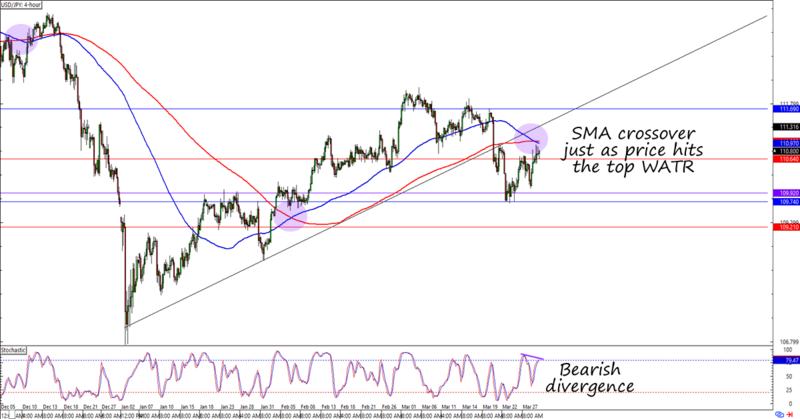 Watchlist: What’s Next for USD/JPY? After breaking a bullish pattern last week, is USD/JPY ready for a new trend? If you were with me last week, then you’ll know that I adjusted the stops on my long USD/JPY trade before the Fed surprised the markets with a “no rate hike” plan for the rest of the year. And I wasn’t the only one surprised! Since the current plan was far from the two hikes planned back in December, the dollar fell sharply across the board. In USD/JPY’s case, the dip was strong enough to break an ascending channel that had been solid since the start of the year. So, what’s next for USD/JPY? As you can see below, the pair found support just above the 110.00 level before bouncing to the 110.80 area. What I like about the current consolidation is that it lines up with the top weekly ATR and the crossover between the 100 and 200 SMAs. And considering that the last two crossovers heralded pretty strong moves, I can’t just ignore this week’s signal. It’s easy to see why traders might be bearish on the dollar. After all, the Fed DID turn dovish when it nixed its rate hike plans for 2019. And then there’s Stephen Moore, the next likely FOMC voting member, who might be favoring a 50-basis point rate cut. Last but not the least is the recent yield curve inversion in the U.S., which set off another round of recession fears and overall risk aversion. There’s still hope for the bulls, though! Optimism over the U.S.-China trade talks, for example, could keep the dollar and other yen crosses supported in the next trading sessions. Ditto for the usual end-of-quarter shenanigans, which could boost high-yielding bets before traders close their quarterly books. For now, I’m keeping my low key bearish bias on USD/JPY on the assumption that (a) the lack of deets in the U.S.-China trade talks would soon translate to some profit-taking and that (b) the end-of-quarter (read: bullish) moves that we’re seeing could reverse soon. How about you? Are you more bullish or bearish on the dollar? How about the yen? Are you trading any major USD pairs lately?